We had been hiking since daybreak. We would have started earlier, but walking in the dark in these mountains is dangerous. 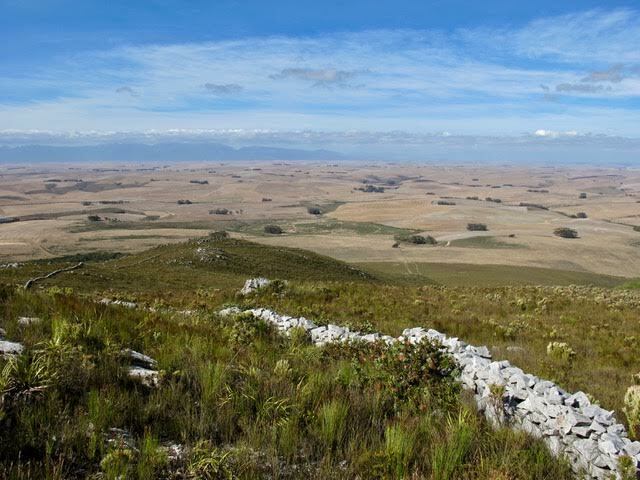 There a few perilously steep sections close to the farm and then there are the puffadders and berg adders – almost impossible to see with torchlight on a rocky buck trail. We stopped first only when the sun burned above our left shoulder. I stripped down to my long-sleeved cotton shirt and glugged icy gulps of water from my partially frozen water bottle. Sweat ran down my face, but I felt strong, my hips and old rugby knees holding up well under the weight of my rucksack. We reached the first infra-red camera by 8am and Harry got busy replacing the memory card and battery. The western kloof was narrow here with steep granite walls. Through natural illusion it appears to be a cul-de-sac of rock. But we pushed on, scrambling up a small wall of rock and into a hidden hollow that you can’t even discern from Google Earth. Another hour of scrambling and we had reached the deepest corner of the kloof where it rises suddenly to meet a ridge of granite running at 800m altitude for four kilometres to the west and the east along the mountain. Hidden behind 6 foot high Protea bushes, which somehow miraculously escaped the last fire, is a flat rock we call “Breakfast Rock”. I packed out the bread-rolls and made breakfast sandwiches with cheese and ripe heirloom tomatoes. 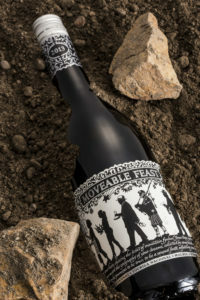 We ate them hungrily looking back down the mountain to the estate vineyards and homestead and across the patchwork Overberg Valley to the far purple Riversonderend mountain range in the north. It is the sort of view that silences one. It is such a visual feast, so awe-inspiringly beautiful that words seem superfluous to the moment. With this wine we want to capture the essence of this corner of the universe, the spirit and the beauty of this place. We want to paint the landscape with aromas and flavours, and we use wine grapes as our art materials.